Everyone tells authors that they have to promote themselves on Facebook, but nobody really wants to hear other people promote their books all the time. So the 20 Facebook groups below are not for self-promotion. They’re for community building. Maybe someone you meet in one of these groups will help you find your next writing retreat, or give you feedback on your next manuscript. Maybe you’ll just get a lot of tips from these Facebook groups for writers on how to live the writing life. With hundreds of writing groups on Facebook, I’ve decided to save you the trouble and weed out the terrible ones. 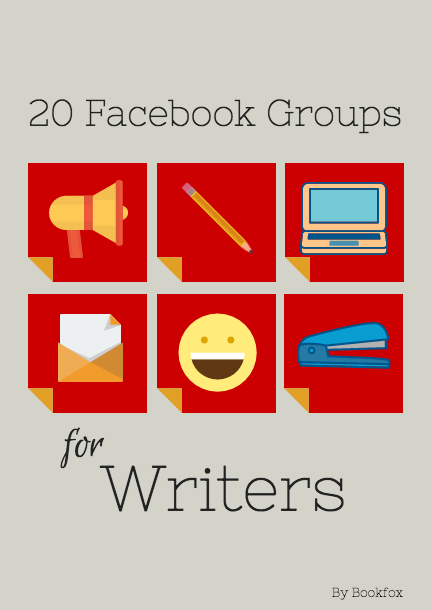 The 20 below are the best Facebook groups for writers. Since creative writing is such a diverse field, there are many niche groups, and I tried to hit as many as possible. There is something for everyone. Happy posting and happy reading! Closed Group (A Closed Group means you have to apply to get in. Most applications are accepted). This group is full of support, resources, and writing challenges. Questions are quickly answered and feedback is helpful and constructive. This group was started by the crew at Bookfox and shares resources to help the community improve as writers. If you need a boost of writing inspiration, or are looking for literary agents, publishing advice, or encouragement, this would be a fantastic group to join. It’s more of an intimate group than other lists on this page, but members are active. Can I promote my book? No, but you benefit from the community in a thousand other ways! This is a very active community of writers that constantly share feedback, ideas, support, and questions. Nearly every post has a large comment and reaction count. This large, and growing, group doesn’t discriminate against any genres. It invites all writers and authors to communicate and collaborate with ideas and resources. This group serves as a discussion board for any topic on the literature spectrum. This group specializes in young adult writers, combining a community of both experienced and upcoming authors to the popular age range of fiction. This group is for both contributors and admirers of short fiction. They encourage members to post their work, as well as links to short fiction contests. This Facebook group is a community of writers that favor suspense and twists. The members specialize in the genres of mystery and thriller, sharing tips and resources. Can I promote my book? Yes, but only once. Are you a creative writer that wants to sweep the reader off into a romantic getaway with roses and dashing men that ride horses? Then this group is for you! If aliens and robots are your cup of tea, you would fit in perfectly to this Facebook group! Can I promote my book? Yes, as a comment on a specified link. This group encourages poets to share their work and receive feedback from fellow members. This is the first Facebook group for children’s book authors, as well as the largest to date. It also has the bonus factor of members that focus on illustrations, making it a great group for collaboration. Readers wouldn’t exist without books, and books wouldn’t be available without the authors that write them. A large group wraps those all up into one by inviting writers and readers to come together to create the ultimate literary community. Can I promote my book? Yes, but not more than once in a 6 hour time frame. This group is so intriguing because it rolls together everything in the world of literature into one, covering all of the bases. On top of the readers and writers, it also includes the reviewers and bloggers who spread the word about said writers and their works. Can I promote my book? Yes, but only once every 12 hours. Racking up over 20,000 members, this Facebook group is a force to be reckoned with. Despite it just being a general group for readers and writers, it welcomes reviews, poems, blogs, and promotions, allowing the members to share with very little restrictions in an accepting community. For writers that want to step away from big name publishers, this is a Facebook group you definitely need to check out. It’s a place for independent writers to share advice, blogs, experiences, and plug your promo as much as you desire. When you’re trying to get noticed in the book industry by possible readers, promotion and advertisement is the name of the game. This Facebook group has a feed made up almost entirely of book promotion. Give it a try and hopefully you can gain a few fans. Here is another large group that is solely focused on promoting as many authors as possible. This community is sanctioned as a “buy, sell, trade” group, making it ideal for self promotion to a place that draws a huge amount of traffic. This group is made up of creative writing college professors. It was too intriguing and unique to leave out of this list. It aims to share ideas, events, and issues within the creative writing field for teaching. May need to update your information. I work on Writers Assembled. We now have over 10,000 members. The interaction is fantastic. Help is available at a moment’s notice. You may wish to mention Writers Conferences. I have three websites: JanKardys.com, unicorn4writers.com and Unicornwritersconference.com. My conference is growing and we have moved twice. Our 8th annual conference is Sept 15, 2018 at Reid Castle, Purchase, NY. Aspiring Authors and Friends is a group for writers also. Great Post! Thank you for all the information!